Project Emporia filters updates from the Twitter public feed and automatically develops lenses on topics based on the likes/dislike preference of readers, providing suggested insight into what’s happening in Twitter around that topic seen through people’s eyes. Project Emporia provides a new, crowd-sourced form of web search by aggregating the relevant tweets from the social networking website with web links around a topic and viewing them as support votes for the links. Type ‘Microsoft’ and filter down by one star relevance in the ‘technology’ lens to get a list of web links about the latest technologies from Microsoft rated highly relevant by the Twitter community. Or change to the ‘business’ lens to get highly rated web links about Microsoft’s businesses. By simply logging in with a Windows Live ID, you can vote on information flowing through Twitter and tune an existing topic lens to your personal taste. This feature will be limited during the Alpha stage of the product. 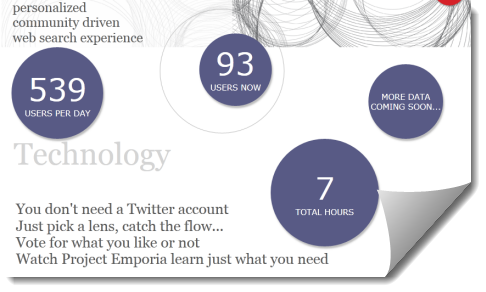 Project Emporia provides a personalized, crowd-sourced, web search experience. Visit : Fuse Labs | Project Emporia website.